When I was a kid I used to love seeing my dad’s plaster handprint that my grandma kept on her wall. I would take my hand and compare it to his. It was an amazing keepsake that my grandma still has kept on her wall. What mom doesn’t love their kids’ handprints? One of my favorite activities to do with kids involve painting their hands. We are seeing more and more creative way to use handprints in craft projects and loving them. 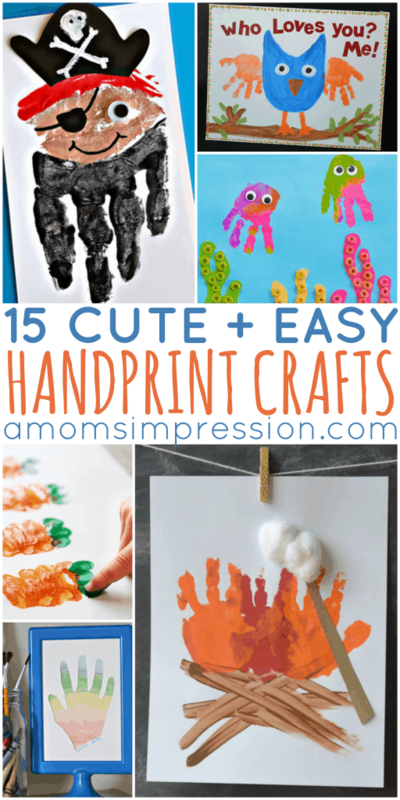 This week we are bringing you 15 of our favorite cute and easy handprint crafts. 8. O is for Octopus Handprint Craft from Crystal and Co.
Do you have a fun craft that you like to make with your handprints? I would love to hear about them or a special memory you may have about a family members handprint. « Easy Clean up at Home or On the Road After Fun Summer Activities!